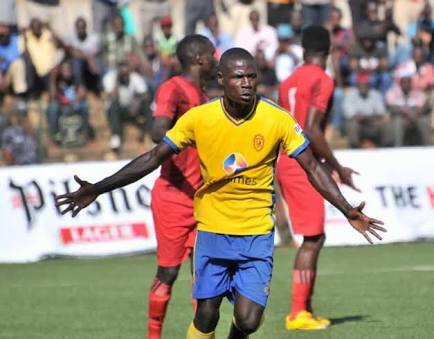 Namboole – KCCA FC defeated Botswana side Township Rollers 1-0 to move third in the Caf Champions League group A. In a not so tasty game played at the Mandela National Stadium on Saturday, it was striker Patrick Kaddu who grabbed the headlines with a close range shot that found the back side of the net with eight minutes to play. The result takes KCCA to six points, four behind second placed Esperance who lost to leaders Al Ahly on Friday. For Township Rollers, they are now at the foot of the group with three points from five games. The game started slowly as both sides could not penetrate into the final third until the 7th minute when Edwin Maolosi lashed onto a defence splitting pass by Kago Monyake but his low shot was turned out for a corner by KCCA custodian Tom Ikara. KCCA FC’s first sight of goal came three minutes later when Patrick Kaddu’s speculative effort from 23 yards flow over the cross bar. At the other end, Mosha Gaolaowe threaded a throw ball for Sikele Motsholetshi whose resulting low shot was turned out for a corner by Ikara. On 17 minutes, it was KCCA’s turn to put the visitors under pressure. Dikago Wagarre in the Rollers goal kicked straight at Muzamir Mutyaba who teed up Saddam Juma for a shot but it rattled the up-right on its way out for a goal-kick. Gambian referee Gassama Bakary flashed the first and only yellow card of the game on 22 minutes when defender Ncenga Obuile handled the ball outside the area while on the ground to prevent KCCA midfielder Allan Okello running through on goal. KCCA took over the initiative and on 33 minutes, Julius Poloto crossed into the area but Kaddu could only direct his header onto the bar with Dikago beaten. Nine minutes to half-time, Kaddu robbed Ncenga of the ball and played Okello through on goal but his weak header was punched away by Dikago to ensure that the half ends in a stalemate. Both teams made two quick substitutions at the start of the second half with Isaac Kirabira coming on for Jackson Nunda for the home team while Galabwe Moyana replaced Kago Monyake for the away side. The chances where scarce at the start I the second half and it was the visitors who created the first opportunity with Boy sending in a teasing cross but Ikara punched it out for safety. Rollers’ best chances of the half came on 54 minutes when Boy crossed in low but Mosha’s close range shot was blocked by the onrushing Ikara. Two minutes later, Saddam sent a long ball over the Rollers’ back-line and it found Kaddu who could not direct his over-head kick goal wards. With 19 minutes to play, KCCA FC head coach Mike Mutebi brought on Gift Ali to replace the below-per Muzamir Mutyaba. Chances started flowing for KCCA and on 79 minutes, Kizza sent in a low cross but Poloto failed to tap the ball into the net from five yards. With the game headed for a stalemate, Ali was fouled on the right and Saddam sent in a teasing cross which was not dealt with by the Rollers’ defence and after a goal mouth scramble, Kaddu fired in from close range to make it 1-0 to the home side. The goal was Kaddu’s first on the continent. KCCA FC had a chance to make it 2-0 with two minutes to play but Poloto blazed the ball over with only the keeper to beat. KCCA’s last group fixture will be away to Al Ahly while Township Rollers host Esperance.